In the universally-praised Returning to Earth, Jim Harrison has delivered a masterpiece—a tender, profound, and magnificent novel about life, death, and the possibility of finding redemption in unlikely places. Donald is a middle-aged Chippewa-Finnish man slowly dying of Lou Gehrig’s disease. His condition deteriorating, he realizes no one will be able to pass on to his children their family history once he is gone. He begins dictating to his wife, Cynthia, stories he has never shared with anyone—as around him, his family struggles to lay him to rest with the same dignity with which he has lived. 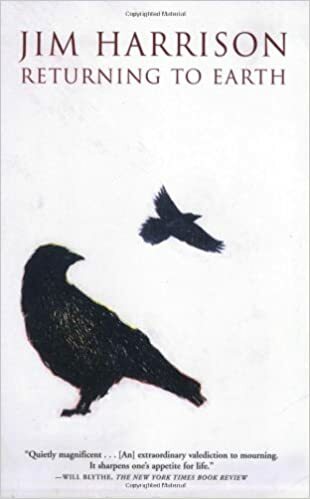 Over the course of the year following Donald’s death, his daughter begins studying Chippewa ideas of death for clues about her father’s religion, while Cynthia, bereft of the family she created to escape the malevolent influence of her own father, finds that redeeming the past is not a lost cause. Returning to Earth is a deeply moving book about origins and endings, making sense of loss, and living with honor for the dead. It is among the finest novels of Harrison’s long, storied career, and confirms his standing as one of the most important American writers now working.